Text-only view, with variants for grays, status colors, name colors, and full color (status and names). 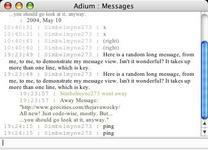 2005 March 25: Updated due to consecutive status messages not appearing (bug fix). I was originally asked to do an extremely simple style similar to this, but turned it down. personally, I feel like it could benefit from colors for the names that stand out a lot more and/or bold text for names. On the plus side, this works very well for those who like to use their own fonts, sizes, and colors. This one should come with the main client. Well done. I really love this one. Its so simple, yet it is perfect. This is my favourite out of the whole lot - non-ugly and clear ! Very nice. As stoic as it gets, and all the better for it. I made a modification of this one which has all text as the same font, which I think is simpler and more elegant. However, it's nice to see a relatively simple message style instead of one laden with a billion borders and graphics. this is exactly what I want -- no extra junk, just text. But this 8-pt. courier font is unreadable. How can I change the font to my default Adium font (Lucinda Grande 12-pt.). Also, I'd like to get rid of the times, but the font is the most important thing. Eventually people will realize simplicity is the key in HCI. Especially in today's online, traffic-dense personal information systems. This is my theme of choice. I'm sorry, I find this an eyesore. Just my opinion. The time stamps are unnecessary and too long, and the screennames (with the time stamps) seem to push messages out into a nearly half-window length indent. Could be better... perhaps putting the messages BELOW the name/time rather than inline?